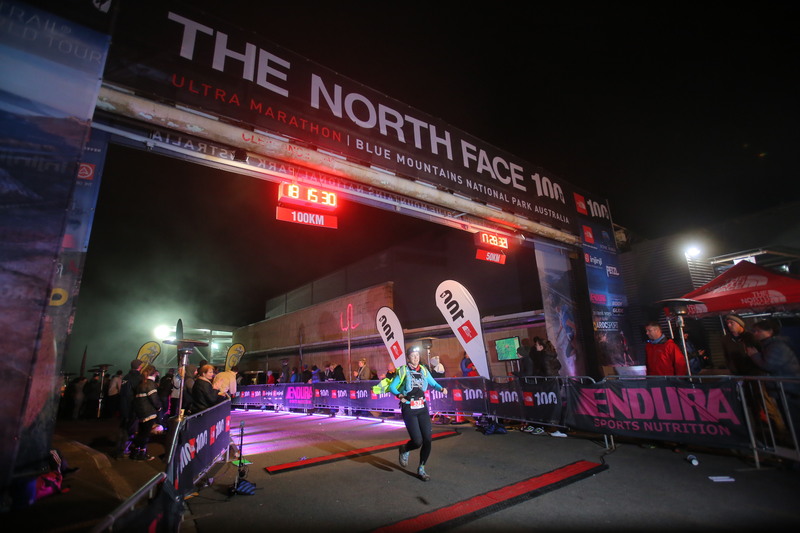 Like most of my race reports this is a long one, so grab a cuppa and get comfortable while I take you on a ride through the 2015 North Face 100. 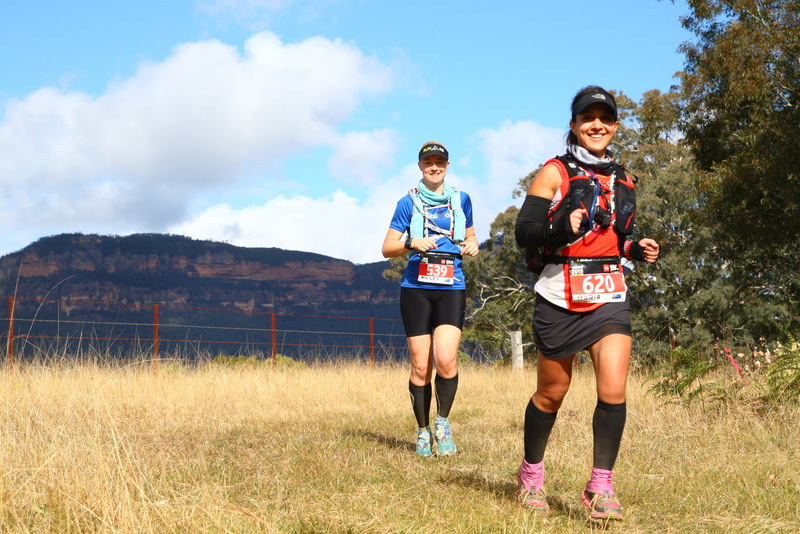 On the Friday before race day I picked up my running buddy Maria and we made our way up to Katoomba in my little Toyota Yaris. I wish I had taken a photo of the boot of my car as it was chockers with gear for the run. We looked like we were going away for a week!! We then checked into the 3 Explorers Hotel which was old but very comfortable and cosy, as it had a working heater and electric blankets. Maria and I carted our gear up to the room on the first floor (and spoke of how much we would hate these stairs on Sunday, ha ha) and got our gear ready for race day. My sister (Shelley) who had generously put her hand up to be our support crew (for a second time) would arrive on race morning to drive us to the start line. 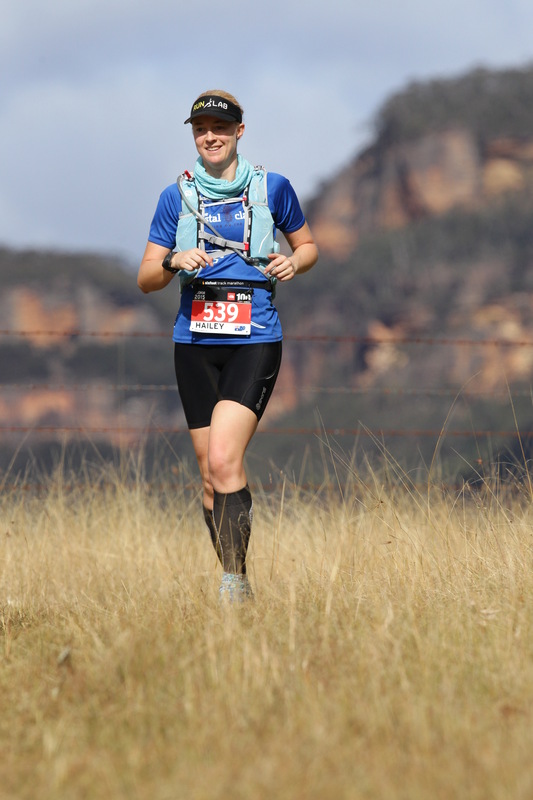 My training in the lead up to this race had fallen (very) short of the kms I would like to have run, but a few small niggles had held me back along with starting my own business and not having the time to fit in as much training as I would have liked. I had spoken to my coach Damon about these issues in the weeks leading up to the race and to be brutally honest we thought that perhaps I should drop back to the 50km event, which I almost did. 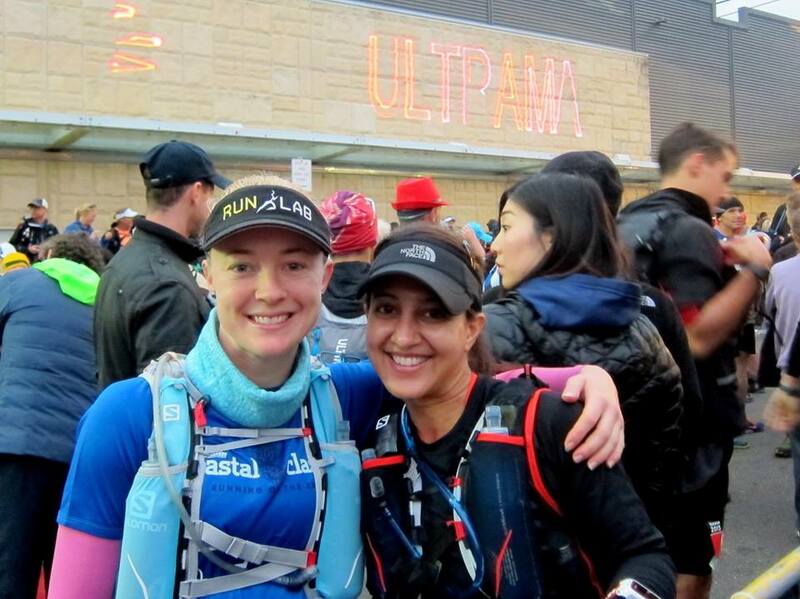 But my stubborn Taurean nature kicked in and I decided to lower my expectations for the race, so instead of aiming for a time my goal of 18 hrs that Maria and I had previously spoke of, instead I would be just aiming to finish the race. This decision meant that perhaps Maria and I would not end up running the course together because I did not want to hold her back from her goal, especially when she had been running up a storm and smashing her running goals lately! So Maria packed her drop bags in case we did not end up running together and then we caught up with our good friend Emma who was staying at the same hotel. I helped Emma with her drop bags too, as she was missing her ultra buddy Dominic (our team mates from Oxfam last year), and we all jumped in my car and headed to Registration near Scenic World. Both Emma and Maria had never run this race before and were very nervous, okay I was very nervous too but I was just trying not to thin k about it!! We had a fun time at rego and saw lots of our running mates, it seemed everywhere you turned there was someone that one of us knew. I saw friends who were doing the 50km for the first time, a friend Todd from High School, some friends from old workplaces and other running friends I had met on the trails over the past couple of years. The excitement and buzz in the room was electric! For some reason it didn’t feel quite real to me yet, that I was actually going to attempt this run again and I think I had been in denial about it all for the past week. 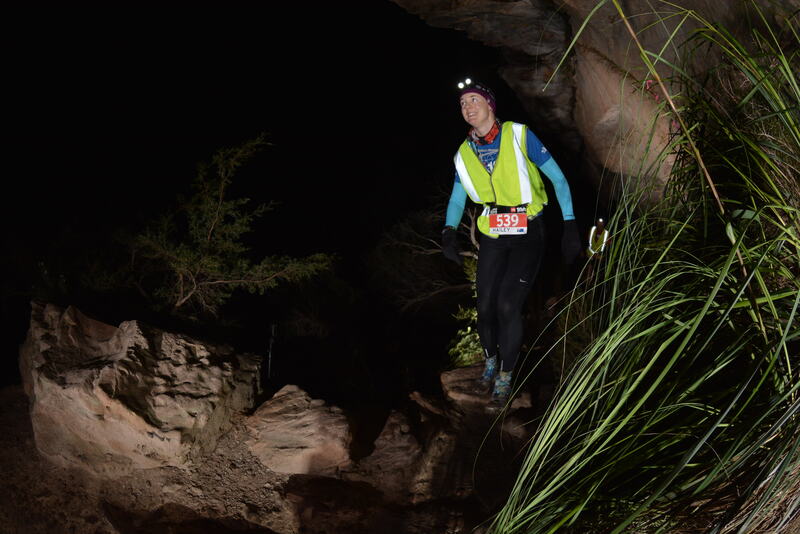 Last year I got injured on Nellie’s Glen (halfway) and I pushed on for a long while, but eventually made the tough decision to pull out at 78kms or risk further injury, I was devastated. I had trained so hard for the run and felt more ready than ever to finish, but (like life) sometimes your run does not go to plan. This year I was going to be rocking up to the start line with a race plan that i’d prepared the day before (last year I worked on it for weeks!!) and with no expectations, just the goal of crossing that finish line. My race plan is a document that I give to my support crew which has goal times and items needed for each checkpoint, and is usually 4-5 pages long but that’s because it also includes directions and maps to each of the checkpoints. Now where was I? After a lovely welcome from the local Aborigines from the area, and some funny antics and information provided by the race director and the safety crew, we left rego quite late and headed back to our hotel for some much needed sleep. Setting and checking the alarm had been set a few times before our heads hit the pillow. Our synchronised iPhone alarms went off at 5.00am, so we got up and prepared ourselves for race day. I had some breakfast (banana, muffin and a coffee) then dressed for the start. Shelley (support crew and sister) arrived at the hotel on time as planned and drove myself, Maria and Emma to the start line. Emma was starting in the wave before us so we let her out of the car close to the start line and then parked the car. 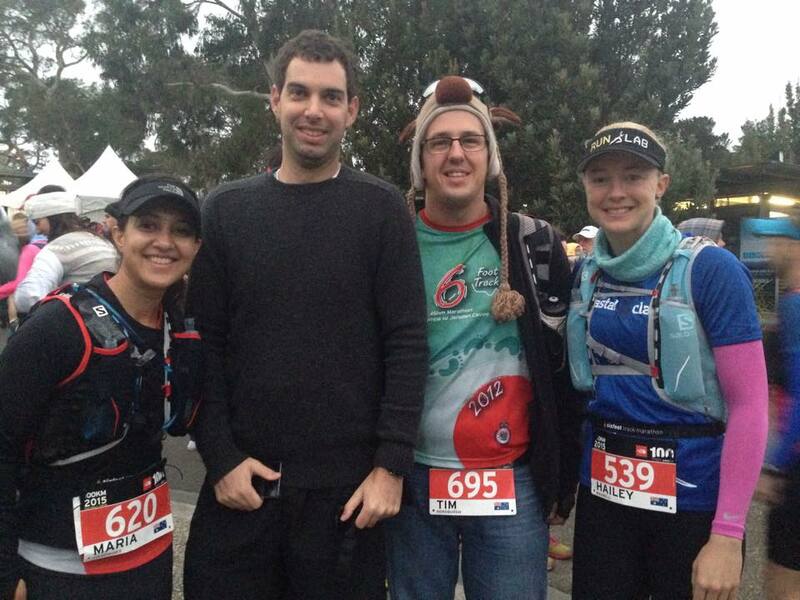 We made our way nervously to the start line and wished many friends well along the way. As we walked up I managed to see Andrew (a friend from my gym) and several of my Sydney Striders mates as they set off in the earlier wave. It was starting to feel real and I could not stay in denial mode for much longer. Maria and I chatted to Leah and Liz and slowly made our way to the start area where all too soon the gun went off and we were running!! The first section of the course is road and includes a few hills, it’s also an out and back which I like in this race because you get to see your mates running back towards you and wish them well for one last time before hitting the trails. 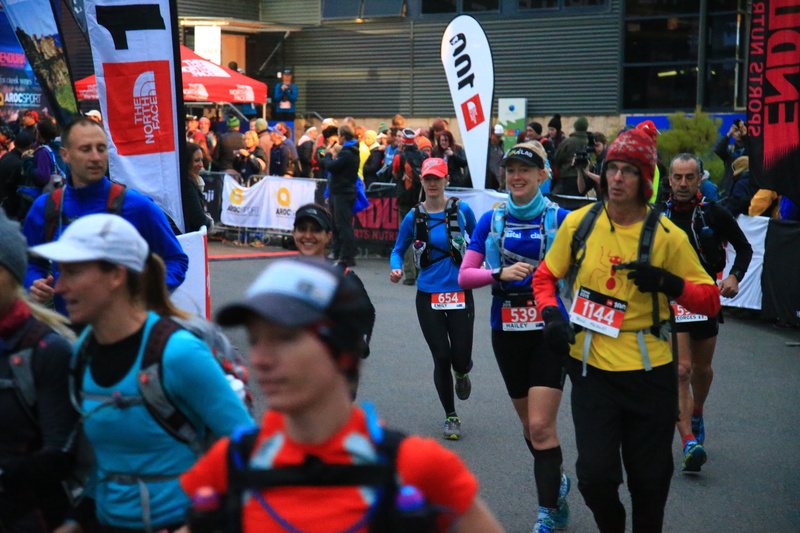 It’s also nice to run back past the start/finish area and be cheered on by all of the many supporters, including my wonderful sister, as we would not see them again until we hit CP3 at 46kms. 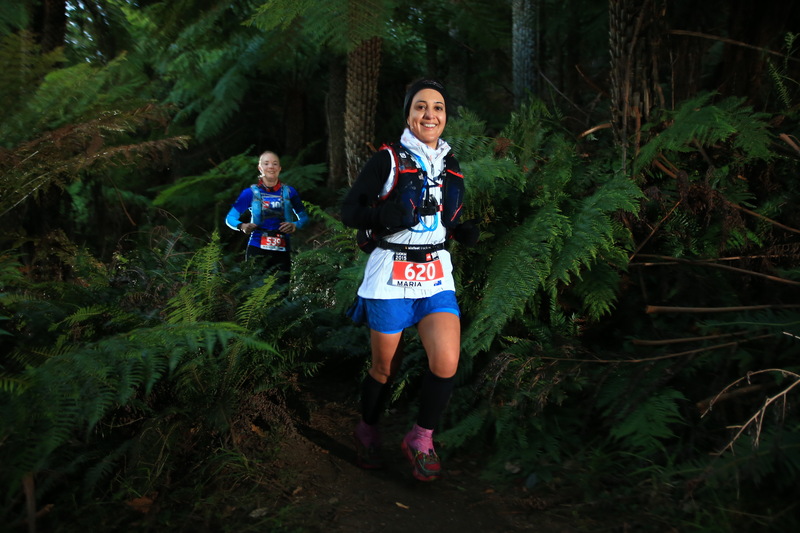 This section was lots of fun and we chatted to many runners through the different terrain. It felt cooler than last year and there was some cloud cover, and I hoped it would not rain. A man playing music and wearing a fluorescent vest (already) went past us up the hill, so we chatted to him and many others who were all in high spirits at this point. Maria and I arrived at CP1 10 minutes ahead of schedule (8.15am) and it was nice to know we had a bit of a buffer up our sleeves, even if only a small one. We both had a quick toilet stop, I grabbed a band aid for my finger as it had been bleeding since my little stack earlier on, and then we got back out onto the trail. This section had some magnificent views as we run at one of the highest points on the course, however I did not stop to take any photos this year as I wanted to keep my momentum going. Maria and I enjoyed running together and were keeping the same pace, much to my surprise as I thought she would be much speedier than me on race day (but that came later, ha ha). We took in the views and eventually got to Tarros Ladders to find a short queue and we waited for our turn. If you have read my blogs before you will know that I do not like heights, so I was a little nervous about climbing down these ladders strapped to the side of the cliff. Okay, I was VERY nervous about it! It came my turn to climb down the ladders (after I let MAria go first) and I tried to calm my breathing and my nerves. And I was doing really well until I got to about halfway and had to walk the narrow ‘plank’ to the next ladder, which meant that I looked down and freaked out. I lost control of my breathing and water started coming out of my eyes, but I just kept saying to myself “One step at a time, keep moving and you’ll get there”. Eventually I got to the bottom, after some much needed encouragement from Maria who was counting the steps for me to let me know how far until it would be over. And when i got to the bottom Maria gave me a big hug and we carried on our way down the mountain. We got into Dunphys Camp at 11.10am which was 50 mins before our scheduled arrival time of midday. Woohoo!! We got some food, filled up our water and queued for the toilet. We spent a little too much time here queued for the toilet, but I did not want to have to go in the bush later down the trail. After a quick chat with our friend Paul we left Dunphys Camp and headed for the next landmark, the Ironpot Mountain. Most of this section of the course is on Private Property so not very many people get to train on this section of the course. There is a very steep hill section up to the top of the Ironpot Mountain and Maria is much better on the hills than me due to her smaller frame. My goal for this early stage in the race had been to just stick with her for as long as I could and so far it had been going to plan, but I feared she would move ahead of me soon. Partway along the ridge Maria got ahead of me and I got stuck behind some runners. On top of the ridge there is an out and back section again, so you get to see many other runners coming back towards you and wish them well. I really like this and just about every runner gives you a smile and wishes you well. The camaraderie out on the trails is amazing. On top of the ridge there was a gentleman playing a didgeridoo, the same gentleman who had welcomed up at the registration the night before. I didn’t stop to listen like last year, but I thanked him (both times I went past) and continued up to the turn around point hoping I would catch up to Maria again soon. After the turn around point I eventually caught up to Maria and we headed down the slippery section off the Mountain and into the beautiful fields that greeted us at the bottom. Then it was onto some fire trail and up a large windy driveway which met the start of the Megalong Road. It’s a tough, continuous slog up that hill and every bend reveals another incline. So you just keep moving and pushing and praying it will end soon. We got to the top and Maria started to run, I needed a minute to breath (or so my head was telling me) so I walked for a little while at the top before gathering myself and catching up to her again promising myself not to lose her yet. 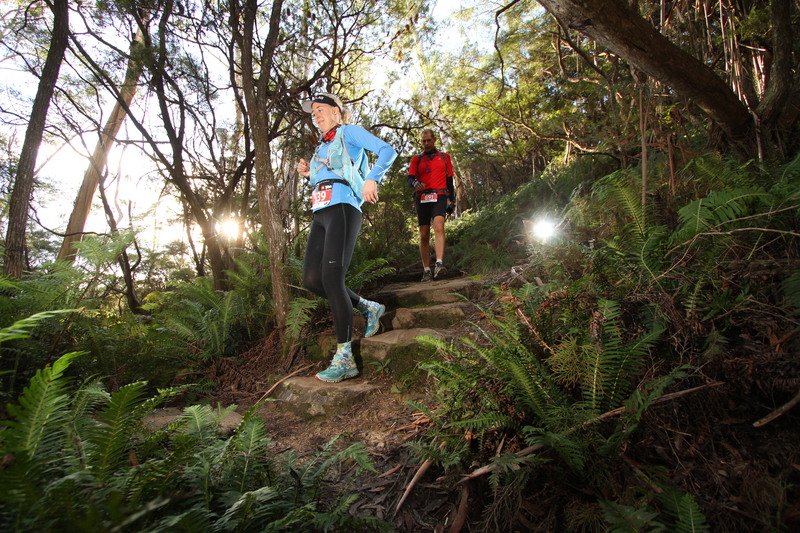 Just before the checkpoint there was a professional photographer and we got some great shots (below). We arrived at CP3 at 1:48pm which was again 50 mins before our scheduled time and we could not locate my sister who was set to meet us there. I gave her a quick call and she was shocked to hear we had already arrived! She was just leaving the car and she sprinted up to meet us with food and clothing while we filled the water up in our packs. 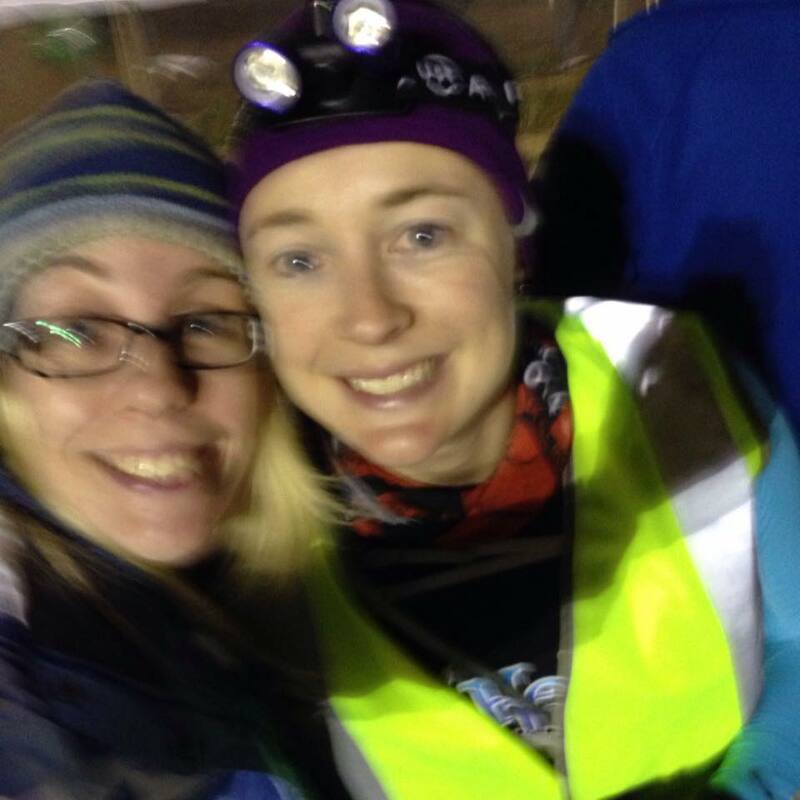 My awesome trail running buddy Sarah-Jane was the first person I saw coming into the checkpoint and I have to thank her for the photo below. 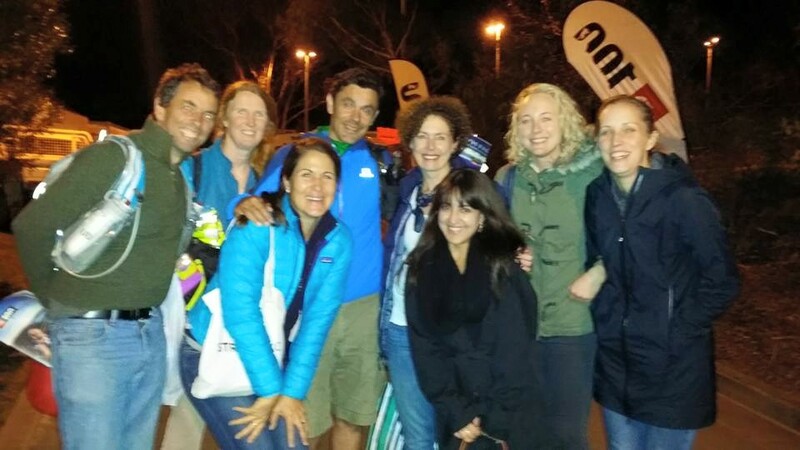 It was great to see a familiar face and seeing all the support crews waiting and cheering us into the checkpoint was such a lift! I changed into some warmer clothes and we chatted nervously to my sister who was so happy that we were progressing as well as we were. She told us we looked fresh and gave us a big hug before we headed out onto the trail again. We left the checkpoint after a 14 minute stop (longer than planned) but felt much better to be in warmer clothes. Maria and I both knew the next section of the course very well as it traveled along the Six Foot track, a trail we had raced and run many times. So we knew the joys of the HUGE stairs that awaited us at the foot of Nellie’s Glen. Maria was looking strong and I was starting to fade a little. We ran together for a while and we collected and chatted to a lovely lady called Ellen who was from the Mountains (Glenbrook I think). Eventually we got ahead of Ellen and then I also had to let Maria go ahead of me. My head was telling me to walk (stupid brain). I was angry with myself for walking these flatish sections, but felt I needed the break to prepare myself for the 900+ muddy, uneven stairs that were coming up. I ended up power walking with a gentleman who was doing his 6th TNF100 and another lady who was running it for the first time. We got to Nellie’s Glen together and I let them go ahead of me as I thought I would be quite slow on this section. Unfortunately I was right and soon I could not see them ahead of me, plus I got overtaken by some speedy runners who were doing some very heavy breathing as they went past. My friend Rob from Nike caught up to me at one stage too and we chatted for a while. He had taken a fall and was not doing too well, he wasn’t very optimistic about making it to the finish line, but I tried to change his mind and keep him positive. To my surprise I caught up to a lady, but she was not in a good way and was vomiting on the side of the trail every 10-20 steps. I didn’t want to get to close for fear that it might make me feel sick too, but I kept an eye on her and talked to her to help her get up the stairs one at a time. Taking the focus off myself for this brief section seemed to make the time pass more quickly and before we knew it we were at the top of the stairs and celebrating! It was about here that I realised how light the sky was. That might sound a bit silly, but at this point last year it had already gotten dark and I had needed my head torch to see the trail and stairs coming up the Glen. But today it felt like there was a lot more daylight left which really lifted my spirits as it reminded me I was well ahead of schedule. At the top of the stairs there was a short section of trail followed by some road into the next checkpoint. As I ran along the street there were people out the front of their houses who cheered me on and wished me well, and I actually overtook some runners before I got to the checkpoint. My sisters smiley face was waiting to greet me as I came into the checkpoint and she helped me change and feed. I put on some dry clothes (thermal shirt) and picked up my AyUp headlamp (thanks Nigel). I also had some help from Sarah-Jane who came over to assist and got me moving and out the door again quickly to make the most of the daylight that was left. I saw Maria just before she was leaving the checkpoint and I would have loved to leave with her but I still needed to eat! So off she went with my blessing and I stuffed some food down my gob. I think it was rice pudding and nutella sandwiches. I only stayed in this checkpoint for 12 minutes, much quicker than last year when I spent more than 20 mins here, and felt elated to be out the door with the sunlight still beaming through the trees. How good was this!! I was so happy!! But this next section was one of the toughest parts of the course, full of stairs and I had bad memories of it last year when I had hobbled most of it in pain. But this year I was determined to run a lot of this section, even the stairs, and I really was feeling fantastic so I pushed it a little harder than I had all day. And eventually (to my surprise) I managed to catch up to Maria who I think had stopped for a toilet break. I was so happy to see her again! You can tell by the smile on our faces below. This section included some really pretty areas. We ran past Echo Point where you could hear runners being cheered over the finish line in the distance. The beautiful Leura Cascades where I had stopped many times for photos during training runs. There was also Lillians Bridge and Wentworth Falls but it had grown dark before we got to these and so the starry sky was now our only view. There was a water point at 66km and we were delighted to see our friend Brad here to greet us with a smile. He had been following our progress after he had completed the 50km race earlier in the day (what a LEGEND!). I quickly made a toilet stop here, then grabbed some lollies and we got back out onto the trail again, into the darkness. It was somewhere in this next section that I lost Maria again. She was still looking so strong and I was still struggling a little, so again I pushed her to go on ahead and kept moving my legs as fast as they would carry me. This year there seemed to be much, much less stairs than last year. I don’t know why, but the mind does play tricks on you when you’re fatigued (and injured like last year). I kept moving at a consistent pace and hoped I would catch Maria at some point. I was still feeling very positive about how I was travelling and even though the legs muscles were feeling tight I did another check of my body and was feeling much better than I had expected to feel at this point. I had changed into different shoes at the last checkpoint and so was enjoying the luxury of the extra foam in my Hoka One One. When I eventually reached the end of the trail and hit the road section which I knew took me down into checkpoint 5, I started to cry. Last year I had started to cry at the same spot but for a totally different reason. This year I was still running, and I promised myself to run all the way down the hill and into the next checkpoint. And I did. 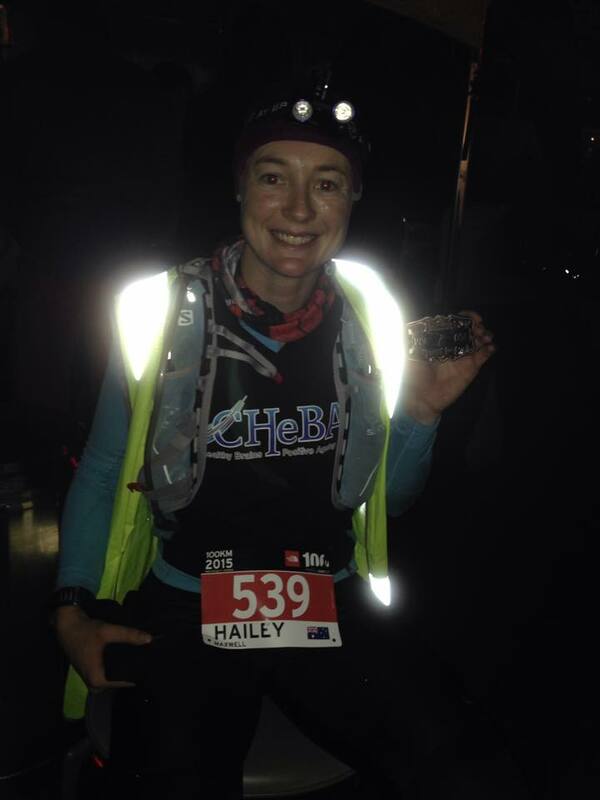 I sobbed my way into CP5 at 8.06pm which meant I was still on track to finish in under 18 hours, it felt like my dream was still within reach. Some of my beautiful Sydney Strider friends were waiting at this checkpoint for their runners and they cheered me in very loudly. Leonor and Margaret had a hilarious sign that said “F**k the wall” and I agreed! Shelley and Brad greeted me with big smiles and were excited at how well I was doing. They told me that Maria had only just left the checkpoint before I arrived and I was thrilled to hear she was doing so well, she would definitely crack the 18 hour target. How exciting! 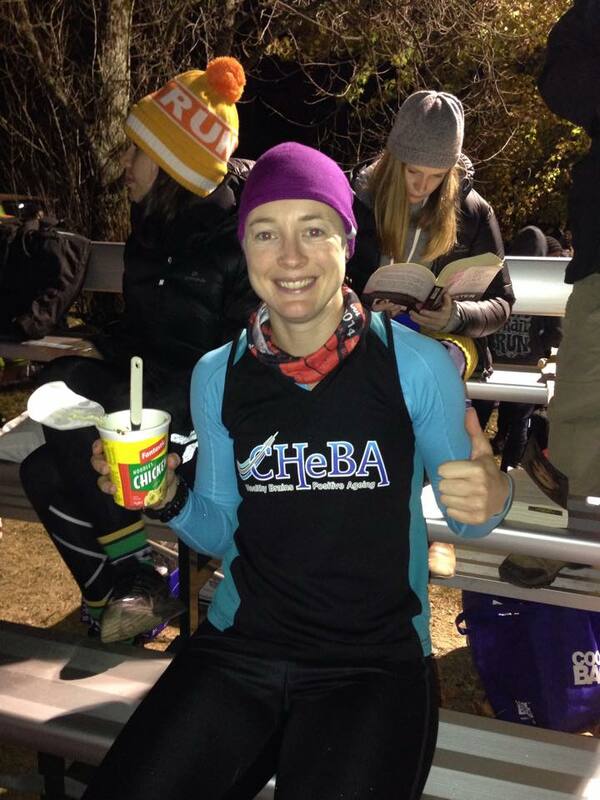 We got me into some more dry clothes and I put my CHeBA (UNSW Centre for Healthy Brain Ageing) singlet over the top of my thermal. I had been raising funds through this event to help Dementia research, as my grandmother has Alzheimer’s, and the singlet reminded me of her and would push me through the hard parts of the next section of the course. I then scoffed down some noodles that I had been craving too and got myself moving again before I got too cold (and comfortable)! I spent 16 minutes at CP5 which wasn’t too bad considering all that I got done and in the back of my mind I was trying to calculate whether or not I had a chance of making the finish within our original 18hr goal time. I headed out into the darkness up the hill towards the start of Kedumba. Kedumba is a 10km downhill section that would tear up your quads and knees if you let it. 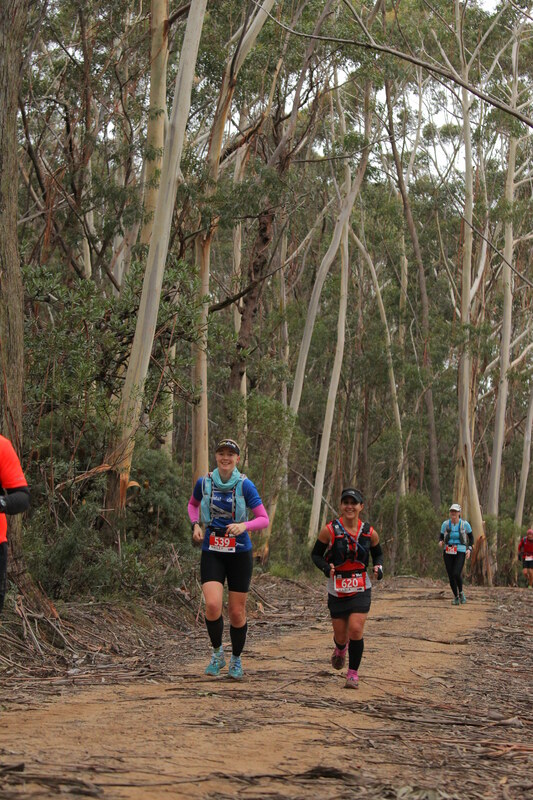 I had promised myself that I would run down all of this section and despite having some knee pain I stuck to that plan all the way, passing many runners as I did so. 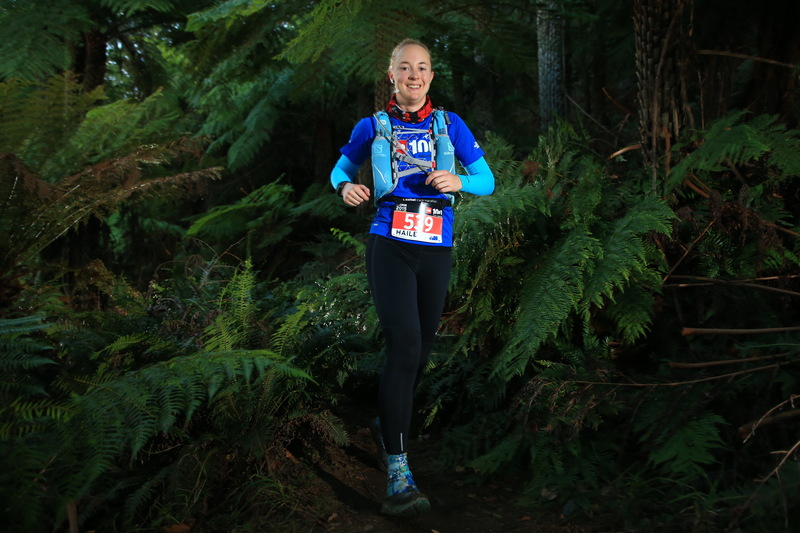 It felt pretty good to be moving past people and keep the legs ticking over, and it also meant that I kept warm. Mos of the downhill here looks the same, wide fire trail with trees either side. There are a few small concrete sections but not very much. 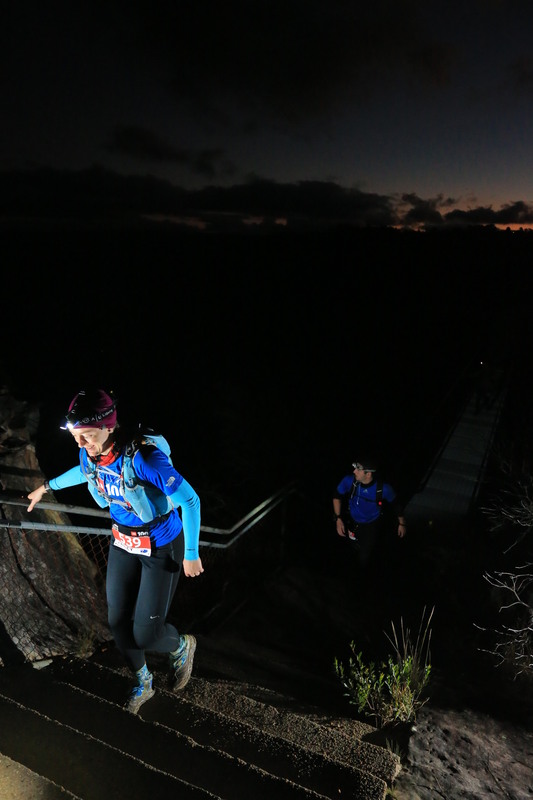 I reached the clearing at the bottom of the mountain at 11.05pm and there was a water stop at the 91km mark. This meant that I had about 1.5 hrs to get to the finish line. It was do-able, but there was a lot of up hill to come so I would need to keep moving, no walking. Here a girl called Ellen caught up to me, we had met earlier on the trail, and we chatted some more as I sat in behind her and just tried to keep up. We were moving at a pretty decent pace (or so I thought) and this section of the trail was very muddy and tricky in some parts. 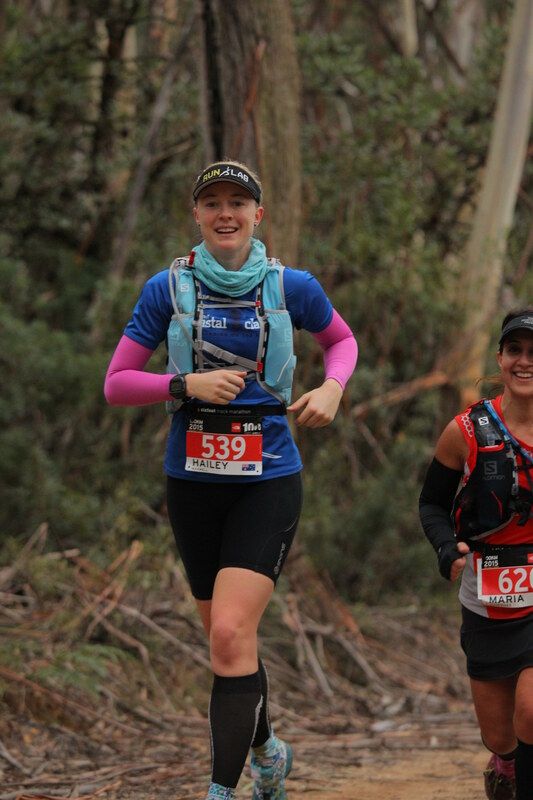 I managed to stick with Ellen all the way to the bottom of Furber steps where I proclaimed to her that I had 20 mins to get to the finish line within 18 hrs. She moved aside and I shot up past her to push myself and use up every last bit of energy I had. My breathing got really heavy and so did the legs, but I wasn’t going to slow down now, I was too close and had come too afr to give up now. A gentleman moved aside to let me past and nicknamed me “Darth Vader’ due to the sounds that were coming out of my mouth (not the first time hey Damon, ha ha). They seemed to be a bit longer than I remembered. When I reached the top near the boardwalk I was completely out of breath and thought I still had about 1km to go. As I looked at my watch I saw there was roughly 5-6 minutes till 18 hours and my head dropped as I feared that I wasn’t going to make it. But to my surprise as i rounded the next corner the finish line was only 50 metres away and I sprinted over the line with the biggest smile on my face! I had done it. I had come back and finished the 100km course in 17 hours 55 minutes!! Getting to bthat finish line is one of the hardest things I have ever done. 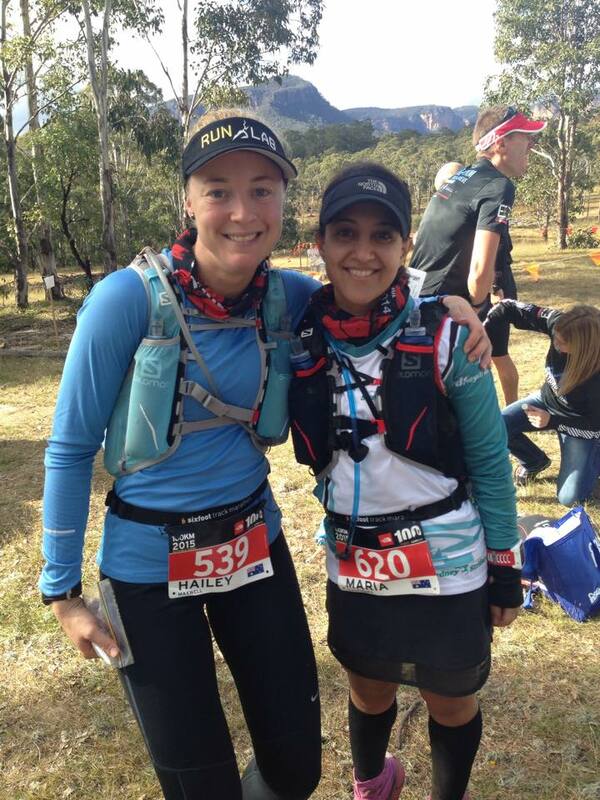 It had taken me 18= months of training and preparation, but I had finally beaten the TNF100 course. I did not let it beat me a second time! It just goes to show that you should never give up on your dreams, no matter how big they are or how far away they might feel at time, just keep striving and learning and planning and you’ll get there. Never give up! Here’s a pic of me holding my Bronze Buckle which is given to everyone who completes the course in under 20 hours. The above results do not take into account the large amount of people who withdrew from the race on the day (DNF). There were actually 1,126 Entrants who toed the start line on Saturday morning but only 840 people who actually finished the race. That means 25% of people who ran did not make it to the finish line, a true testament of how tough this race really is. Now I must say a big thank you to my beautiful sister (pictured with me above on race day) who was not only there for me at this race, but has always been my support crew and motivator at every big race in my life. It has meant the world to me and I will be forever grateful. 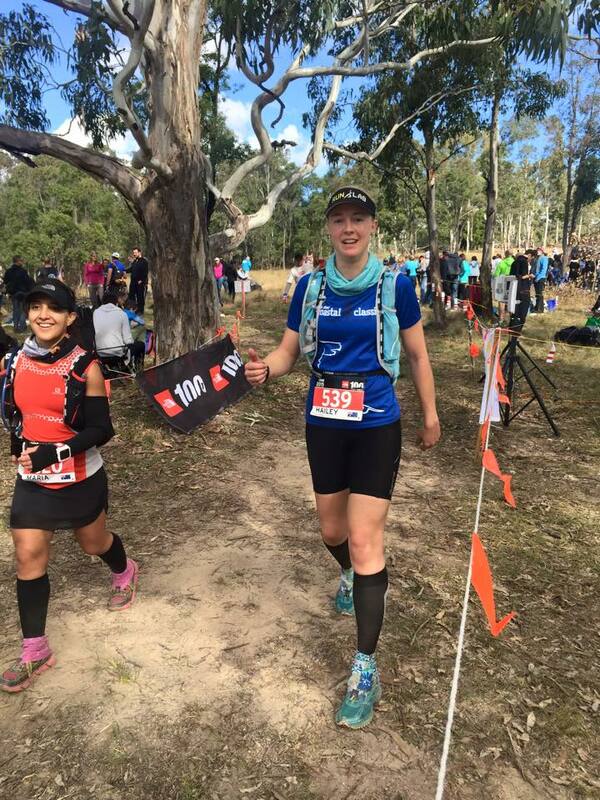 This entry was posted in Race Days, Uncategorized and tagged 2015tnf100, achieveyourimpossible, aliilifestyle, bluemountains, dunphyscamp, followme, katoomba, narrowneck, northface100, runlab, runner, scenicworld, shr, shrunners, striders, sydneyharbourrunners, sydneystriders, thenorthface100, TNF100, tnf1002015, trailporn, trailrunner, trailrunning by laurenhailey. Bookmark the permalink. Bloody hell. Well done. So impressive.